Join us here: https://www.youtube.com/watch?v=1CcSvzAQsA8 Email questions to cwg46@cornell.edu. We will be starting at 1:20PM EDT. Here are the YouTube links to view our broadcast tomorrow 10/25: (Team Organization 11:00AM EDT) https://www.youtube.com/watch?v=VdwHZYzy_lg Email questions to leader@cuauv.org. Hope you will join us tomorrow! Hello RoboSub Teams! We have been receiving quite a few "How to" questions over the past couple months. To promote an open discussion and sharing of knowledge to further advance RoboSub team's vehicles, CUAUV would like to start weekly webinar sessions beginning this Saturday 10/25/14. Webinars (web seminars) will take place over 'Google Hangouts On Air' for about an hour with all the teams that are interested. Each webinar will be dedicated to unique topics such as Sealing Custom Enclosures, Hydrophones System, and Vision Modules. Here is our planned schedule for the webinars: Please note that these times are in Eastern Daylight Time. Instructions on how to view the stream will be posted at least a day in advance. Each Webinar will be recorded and posted on our YouTube channel. Each webinar will also have a question and answer session, so come prepared! If you have any questions or suggestions for more topics, e-mail us at leader@cuauv.org. See you all there! CUAUV is recruiting for the 2014-2015 year!!! CUAUV is recruiting! We're looking for enthusiastic new members to join our mechanical, electrical, software, and business/PR teams! Learn about the team at one of our upcoming info sessions: - Saturday, August 30th from 3:00-4:30PM, RPCC 205 (Auditorium) - Sunday, August 31st from 3:00-4:30PM, RPCC 205 (Auditorium) - Tuesday, September 2nd from 5:00-6:30PM, Upson Hall 211 Applications are now closed. Thanks to everyone who applied. We are looking forward to another successful year! Mark representing CUAUV and showcasing Gemini to KPBS With our success in RoboSub2014, CUAUV has been receiving much attention from local news media, tech firms, and Cornell University. 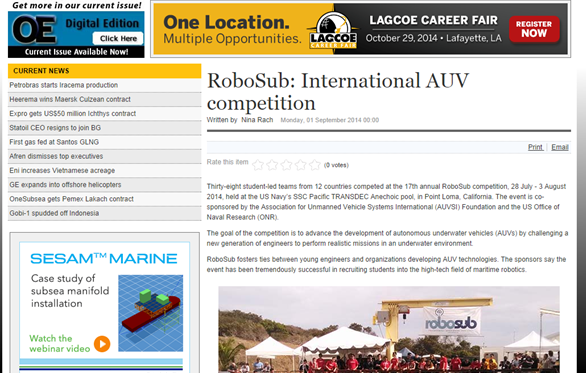 Below are some links that features CUAUV at the competition. http://www.kpbs.org/news/2014/aug/01/underwater-robots-race-glory-point-loma/ http://www.utsandiego.com/video/play/73299/ http://www.news.cornell.edu/stories/2014/08/cuauv-again-takes-top-spot-robosub-competition http://www.ithacajournal.com/story/news/local/2014/08/12/tom-reed-visits-cornell/13942525/ http://new.livestream.com/accounts/3669891/events/3234445 The last link is the livestream of our final run. Since the entire clip is over 3 hours long, please start at 02:24:30 for CUAUV's run. CUAUV cheesing with our friend and another successful team, McGill There is a profound proverb that states "time flies when you are having fun". That wise saying could not resonate stronger with the past week we've had in San Diego. Although we've had our fair share of unforeseen challenges, sleepless nights, 4AM early shifts, and endless debugging of the vehicle, we came out with another successful vehicle and a fantastic final run. But more importantly, it was an opportunity for our team to grow stronger, become closer, and more experienced. Towards the end of the final day, we participated in an AUV race formula-car racing style with our friend and rival, University of Florida. With both teams on the sideline and two vehicles in water, Krill counted down, and software members drove the sub. Subjugator bolted past, and Gemini was forced to eat Subjugator's bubbles. Subjugator and Gemini in water preparing for the race Both teams eager to see the result of the ultimate showdown between 1st and 2nd place teams Much buildup to the anticipated AUV race We really want to thank all the alumni that showed up to the competition. It was a pleasure to match the names we have only seen on prior documentation and old boards to actual alumni who were in our shoes couple years ago. We have been asked multiple times how we have been so successful in the past 3 years. It's because we are standing on the shoulders of our brilliant alumni who have paved the way for us in previous years. CUAUV alumni rocking their old fun CUAUV shirts. Notice all the different colors in their shirts that represent history of CUAUV Current and alumni of CUAUV electrical team What a great year it has been. We have learned a lot this year, and we have become a stronger and closer team. We are excited to see how we can improve our next new vehicle. Here we go, RoboSub 2015! Day 6: The day we have been preparing for. Finals! For the first time during the competition, the unrelenting sun in San Diego took a break. Instead of the instant sunburn inducing brightness in TRANSDEC, ominous clouds hovered over us. This sudden difference in weather forecast meant bad news for many teams, for all of us have tuned our vision in the consistent sunny days in prior practice days. score of the 2nd semi-final run. Cornell close to 18,000 pts and University of Florida right behind us with 16,000 pts. Despite the gloomy weather and sudden downpour, many teams had significantly betters run today than in the 1st semi-final run. Improving from yesterday's mission, software adjusted the appropriate offset of the grabbers. In contrast to the 60% success grab rate in university pool, in TRANSDEC, we were missing majority of our grabs. The offset may have resulted from the tuning controls with tether connected to our vehicle, which would have caused slight difference from untethered autonomous runs. Fortunately, the software adjustments proved to be successful. Gemini circumnavigating the red pole for maximum pts. Considering our score from 1st semi-final run yesterday, we had high chance of qualifying to finals. However, we still aimed to perfect our recovery task. We were excited to see how many of the other teams were more successful today. Gemini waiting on dock to run its 2nd semi-final run. Valve enclosure, thruster board, and computer did not act up today, and we are hoping no more problems will reoccur for just one more day. Best of luck to everyone and see you tomorrow for the finals. Get a good sleep everyone! Team members getting good sleep before final run.